We discovered Rockie is a box cat, he has a little cardboard box in the landing which he loves! He completely shunned all the lovely cat baskets and comfy den's Tom built for him, but fell in love this this cardboard box. aww cats know what they like don't they? hehe my cat used to make me get out of my own bed so he could sleep in it! 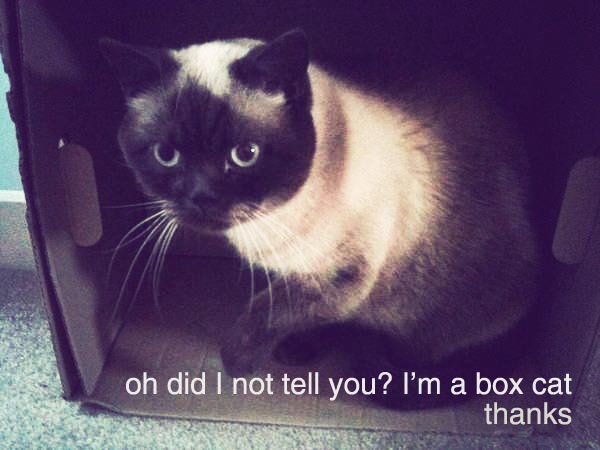 That is adorable :) you know those little boxes you get cat food sachets in? Input an empty one down the other day and my (technically mums) cat jumped in haha. He's massive and it was tiny :) so cute!